I'm in Seattle, Pete's in London, and Shawn is in Los Angeles. Shawn and I were tempted to submit so Pete would wake up in the morning not just to a new app idea, but one that was done and submitted! But he makes the best icons, so we waited so he could see and do up a cool one for it. A nice video of it in action, finding all 477 screenshots on my iPhone from years of app development and photos following along between phones. Or as my brother Pete called it "Smurfberries for Business Apps". We spent the better part of the summer working on iOS 7 updates. We'd originally planned a different approach for updating our main apps for iOS 7. (An FTP Client and code editor.) But in the end, a week before iOS 7 was scheduled to come out, we decided people would have to pay to get the upgrade. Along with most other developers, we have wanted a way to charge an upgrade price to get a new major version of an app. And we wanted to be nice to our existing customers and give them a discount. We're not just competing with other apps, the iOS7 update is competing with our previous version which is pretty damn good. If asked to pay full price again, many people (including myself) might stick to the older version which already works great. It isn't as perfect as Apple could do it, all within a single app and not losing our thousands of 5 star ratings, but it works now. You have MyTool in the App Store now, for $9.99. In the 2Upgrade app, when they tap the locked feature, check if they have MyTool installed, if they do show an In-App purchase to unlock with the price $4.99; if they don't then show a 2nd In-App purchase item to unlock with the price $9.99. All the In-App purchases unlock exactly the same things in the app, but with differing prices. Get our apps and see it in action (and support our continued staying-in-business-ness)! 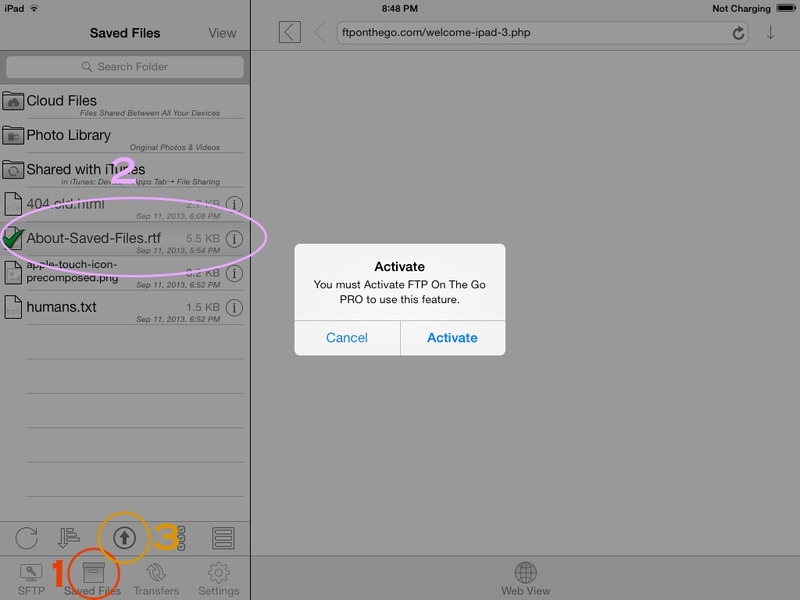 1st get the FTP On The Go Pro Upgrader for iOS7 mouthful app. A quick way to get the Activate prompt is to switch to the Saved Files tab, tap the "About" file, then tap the up-arrow-in-a-circle in the bottom toolbar. Tap to Activate and you'll get the full-price In-App purchase for $9.99. 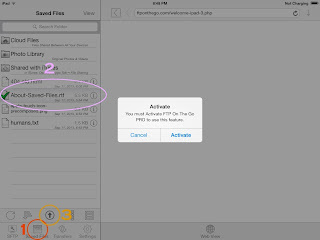 Then on the same device, get FTP On The Go or FTP On The Go PRO, they've been discounted so are $3.99 and $6.99. Once one of them is installed, go back to the Upgrader and do the Activate again. You'll get the discounted prices; $6.99 if you have the standard, or $4.99 if you got the PRO (you'll save $1 if you get the Standard and upgrade that one.) Buy the upgrade to help keep us in business! * Not an idle threat about going out of business, if this doesn't do it we've got maybe 6 months before having to either have something work, start doing contacting, or downsize to just me full time. Having to do that after nearly 17 years in business, and working with my brother Pete and friend Shawn for the past 15 years would be horrible and would greatly impact what sort of updates our apps would get in the future. ** You wouldn't even have to have the paid MyTool2, all the magic happens in the MyTool2Upgrade. *** We are leaving the existing apps in the store with lower prices, so we can do bug fixes or security updates. At the least you'd be smart to do an update that detected if they were using MyTool on iOS7 and showed a message about upgrading! There are a variety of ways how 2Upgrade can detect if you have MyTool installed. iCloud key-values. An excellent way since it can detect they had MyTool even if it isn't currently installed on the device. Keychain. Also a good way, nice and secure. We started with the Custom URL scheme one; simple and works even with quite old existing versions of our apps. We'll add better checks now that we know Apple is going to allow this whole system. App discoverability is really tough in the App Store anyway. If you don't want people searching to stumble on the 2Upgrade app and want them to find the new MyTool2 Paid app, it should be pretty easy by giving few or no keywords to the 2Upgrade. That won't help people searching using Google, but Apple seems to just use the name and keywords for their search results. Stats are coming in now that reviews for the iPhone 5S are appearing. I ran the same browser benchmarks on my "Late 2010 Macbook Air". I didn't reboot the iPhone or anything, just started the tests so they may be better if I'd restarted first. My big 2009 iMac still beats the iPhone, its numbers are better but not twice as good. All the iPhone numbers are using little cell phone batteries. Apple in the past has run the iPhone CPU at a slower speed to keep battery life up. Running the same chip in a Laptop type device, the CPU speed could be higher with a laptop's bigger battery, as well as the CPU cooling that's built into laptops too--fans. Fans aren't something you'd put in a phone or tablet (oh, unless...). My Macbook gets pretty warm, and the iMac gets pretty hot on top. The Retina iPads are already higher resolution than my laptop and desktop, so they've figured out that part too. If I was Intel or other computer companies, I'd be worried. Bump up the speed a little, and it could easily get comparable to the current Macbook Airs, and likely with similar or far better battery life. Intel doesn't make billions by giving its chips away. I'm sure Apple gets as good a deal as anyone, but making their own chips, they'd not be paying anything more than what it costs them to manufacture--and they're already building these chips by the millions. I've not done it yet, but would be simple to do a similar thing with UIActionSheet too. //Then you get to use it like this!